The overall consensus among British Mycologists on the 2002 mushroom season in Britain was that it was the worst for 15 years. 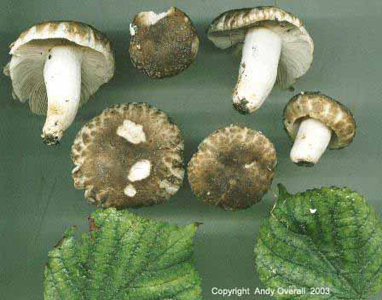 Adversely dry weather persisted throughout the bulk of the Autumn months affecting the fruiting patterns of many fungi species. Following a survey that I carried out at Oxleas Wood in Greenwich last Autumn I concluded that the Mycorrhizal fungi were hardest hit by these unusually dry conditions. Among this type of fungi are the Boletes one of which ‘The Cep’ is quite common among our mixed deciduous woodlands, heaths and parks and a big favorite among the fungi gourmets out there. Boletus edulis, The Cep (French), Porcini (Italian) and Penny Bun (English) has to be one of the most well known of our edible mushrooms. Even if you aren’t that familiar with it you would of come across it at some point as this mushroom is regularly used to flavour popular mushroom soups. Nowadays it is used frequently in fresh and dried forms by restaurants across the country. In the wild this mushroom forms a symbiotic relationship with various broadleaved trees and species of Spruce (Picea), this relationship known as a Mycorrhiza is important in nature as various, essential trace elements and water are passed onto the plant/tree to help with healthy growth. The mushroom in turn receives organic carbon, minerals and water. 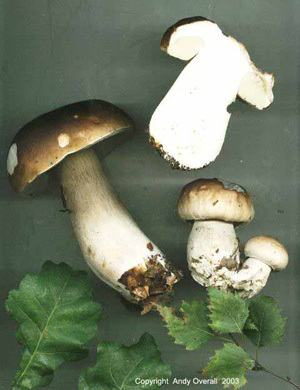 The Cep in not so fussy about which broadleaved trees it grows in association with, unlike some of its close relations, therefore Boletus edulis is not so difficult to find. 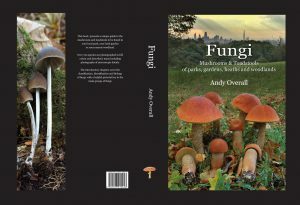 However, this mushroom will not be growing under every tree in your local park, not only is it a very popular edible mushroom, but it also has a preference for free draining/sandy soils. I decided to start my ‘fungi to be with’ forays earlier in 2002 thinking that we may indeed have an early Autumn, in fact summer, lovely in many respects, went on and on and on. When you have 20 or so people eager and ready to pounce on an expected abundance of earthly gems, well, where is David Blaine when you need him? Still it seems whatever the weather, the fungi kingdom will always throw something unusual or exciting your way, if you’re out looking! and 2002 was no exception. On a routine recky through nearby Golders Hill park I stumbled across a species of Russula that looked familiar at first but which subsequently turned out to be a species new to Britain. This species of Russula is normally, though rarely found growing among the Holm Oak of Mediterranean countries such as Cyprus and the like, so to come across it on Hampstead Heath growing with Lime was quite a surprise. It is the first time this species has been found in Great Britain. It is one of a few species of Russula that have a simple veil covering them before they break the soil, the remnants of which can be seen in the picture as small greyish patches on the cap. 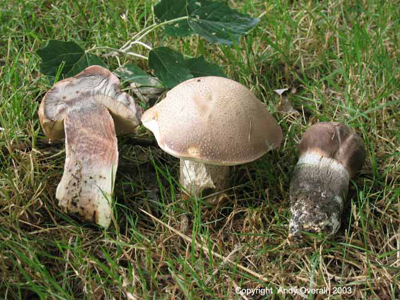 As with The Cep and the other Boletes, the Russula family are all mostly Mycorrhizal with a wide host of partners. 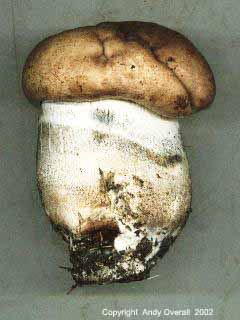 Leccinum durisculum is an uncommon member of the genus Boletaceae-sub group Leccinum. It is a mycorrhizal species prefering members of the Populus family, usually growing with Aspen. These specimens were found growing with Grey Poplar (Populus canescens) right in the middle of a busy London thoroughfare. The stem normally has a kind of dark band circling it, on some from the base up (Top) on others higlighted around the middle (above) the apex is always whitish and the flesh at first flushes pinkish turning dark on cutting. 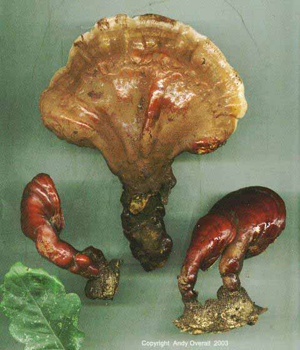 Ganoderma lucidum is a member of the Ganodermaceae family,there are five other species that occur in Britain they are G.australe, G.applanatum and G.pfeifferi which are perennial and G.resinaceum and G.carnosum along with G.lucidum that are annual. They are commonly called ‘Bracket Fungi’ as are species belonging to other families such as the polyporaceae. Apart from the very common Birch Polypore (Piptoporus betulinus) the Ganoderma perrenials are most likely those big hard brackets on the trees in your local park, G.australe being the most common. 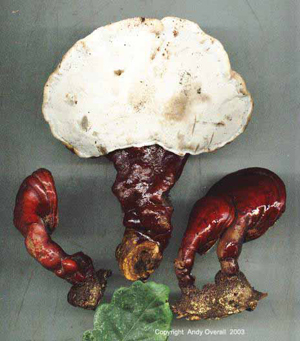 The first three species named are considered parasitic and cause a soft white rot to the host tree. 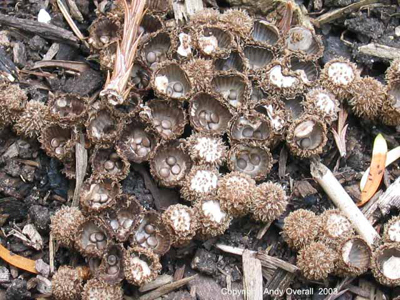 G. resinaceum is considered to be mildly parasitic/saprophytic (recycler). 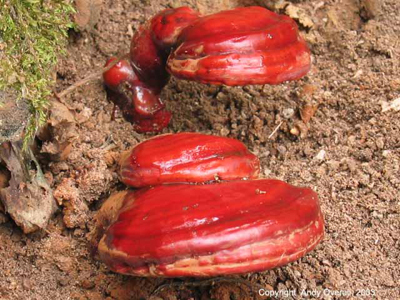 Ganoderma lucidum is usually found near the roots or among the soil surrounding the roots as a saprophyte (recycler) of dead Broad Leaved trees especially Oak. All three records that I have made have been in this situation. The fact that it grows on broadleaved trees sets it apart from the very similar G.carnosum which only grows on conifers as a saprophyte, mainly of Silver Fir (Abies). 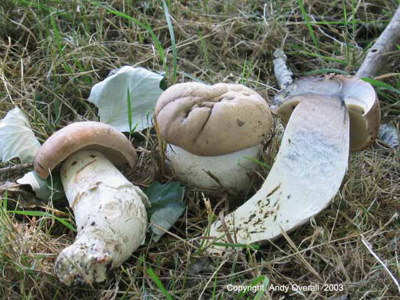 G.lucidum is a relatively small species compared to some of its sometimes huge cousins, rarely exceeding 300mm across it has an eccentric, knobbly, red/black stipe (stalk) which has a laquered look as does the pileus (Cap). Underneath the pileus the pores are small, whitish grey and bruising grey when handled. The pileus starts off hoof shaped becoming kidney shaped as it matures. This lacquered surface is quite brittle and fragile, it can easily be punctured with a finger. The species is at its best aesthetically following rain when all the spores and dust are washed away to reveal a bright red shiny oddity peering out of a tree stump, weird and wonderful. 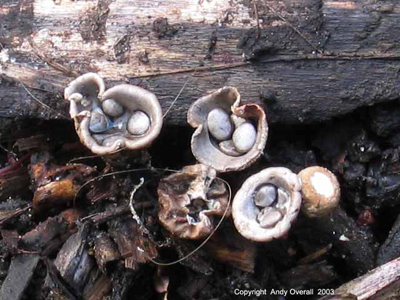 Not your usual looking fungus by a long way the Bird’s Nest fungi shown above belong to a family called the Nidulariaceae the specimens shown here were found growing on woodchip beds, which for Cyathus olla that prefers sandy or chalky soils is a rare substrate. The little egg/pip like forms in the middle of the cups are called peridioles and it is they that contain the spores which are individually connected to a fine umbilical like thread called a funiculus. Not a fungus that you would notice readily and added to that they are considered to be quite uncommon in the U.K. but where they do thrive, they thrive gregariously. Small, beautiful, weird and wonderful.